The Lonestar Soccer Club's (LSC) Select Soccer Program is renowned throughout the country as a player development program with a mission, Winning Through Development. Select teams currently train at 8 locations throughout Austin: St Stephens::Steiner Ranch::Town & Country::Westcreek::Williamson County Regional Park::Justin Lane :: Applegate Park :: RRMC and Voigt. Lonestar SC offers players a unique and full spectrum of competition. See below for information on each program, and for general program details and questions please contact the appropriate Director of Coaching (DoC). Round Rock, TX​ - On Friday, March 24, 2017 Lonestar Soccer Club (LSC) and Round Rock Soccer Association (RRSA) announced a strategic partnership to provide a unified resource structure aimed at benefiting the players of Round Rock at all ages and levels of play. The catalyst for such a collaboration stemmed from the realization that both organizations were serving the same community and were aligned from a developmental standpoint. A big thank you to RRSA, its Board of Directors, and staff for choosing to partner with Lonestar.,” says Buck Baccus, President of LSC. “To all members of RRSA, please know our professional and administrative staff will work tirelessly to meet and exceed our duties and obligations in this partnership; in particular, the prosperity of the recreational program and the growth of opportunities for players to participate in all levels of play. On a personal note, our family began our youth soccer adventure almost twenty-five years ago with RRSA; it gives me great pleasure to be re-engaging with such a fine organization teeming with high caliber soccer enthusiasts working hard to improve the game of soccer for our youth. Both organizations will collaborate while managing the programs RRSA offers: Recreational, Jr. Academy, Select and Tournaments. This partnership will improve communication to the members, streamline operations, and create a unified management curriculum that will benefit all staff, parents and players. Providing a quality, safe and enjoyable soccer experience for the Round Rock community is the number one goal of RRSA,” said Paul Thiessen, President of RRSA. 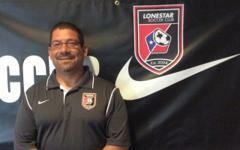 “We believe this partnership with Lonestar will further that mission – from recreational levels up to select soccer. We look forward to working together to provide the best training and playing opportunities for all current and future players at every level while continuing to enrich the Round Rock community that we are so very proud to be a part of. Known as the leader in full-service youth soccer operations in Central Texas, LSC has a simple mission to be the best youth soccer club in the nation while developing good people. The leadership of RRSA not only showed their willingness to support this mission but have proven to be active players in making Round Rock an integral location for soccer development in the country. Check Lonestar SC website for more news & details. Follow us on facebook, twitter & instagram for the latest soccer action! We are happy to have Robert on site to work with our current recreational program and Jr. Academy staff and create synergy in this partnership with Lonestar Soccer Club.